Tongue-eating. Louse. There's not much to like about those words. In fact, one gets the impression that it'll be something utterly disgusting, like, I don't know... a louse that eats tongues. Something horrible like that. Yeh. The Tongue-eating Louse is a parasite from Californian waters, but it's far more abominable than your average blood sucking intestine botherer. It starts when a youngster attaches itself to the gills of a rather attractive and entirely innocent Spotted Rose Snapper. It grows and becomes male. Maybe it's feasting on fish gill mucus? That would be disgusting if I didn't occasionally take cod liver oil. Anyway, at some point it matures into a female, probably all embarrassed about those silly things it used to do when it was a young male. Then it probably mates somehow. I wonder if it mates once as a male and then once as a female? Who knows? (I really don't know if anyone knows...) Who cares? (I kinda do) We got Tongue-eating to do! And it doesn't involve teenagers kissing with inappropriate passion, either. 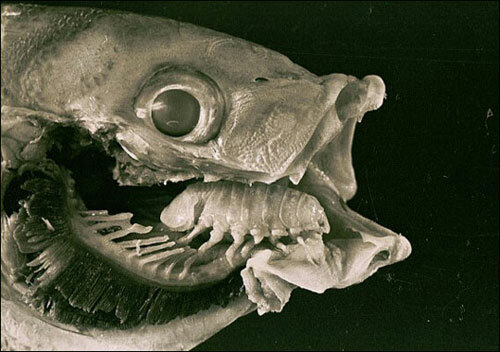 The Tongue-eating Louse moves into the Snapper's mouth, places itself on the tongue and... doesn't actually eat it. Instead, it grabs hold and drinks blood from it. 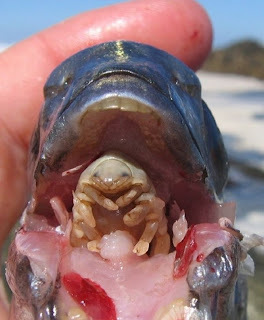 In fact, this isopod drinks so much blood that the tongue atrophies away, starved of all nutrients. But the Tongue-eating Louse is a kind hearted parasite. It wouldn't do a fish such a wrong and leave it pining for the memory of its tongue. Not after all the blood and mucus it so kindly provided whether it wanted to or not. 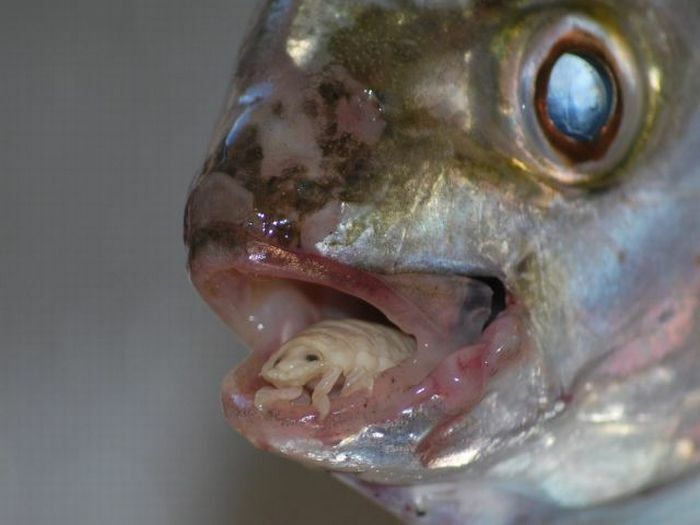 Instead, the friendly louse grabs hold of the stump left in the Snapper's mouth and serves as a whole new tongue. A tongue with eyes and 7 pairs of legs. At 3 to 4 cm in length, the Tongue-eating Louse is just about the right size and even allows the Snapper to use her like an actual tongue. Sure, the Snapper won't be able to kiss with inappropriate passion ever again, but at least it won't starve to death. Or whatever happens when a fish doesn't have a tongue. And neither will the louse. In return for not leaving her host in life-endangering devastation and grief over a lost organ, she feeds on yet more mucus with a bit of blood for dessert. For ever and ever. Until death do them part. Sort of cute in a way. So here's my question... if the louse feeds on the blood and the mucus, why is it facing outward? Wouldn't it be easier to face inward? 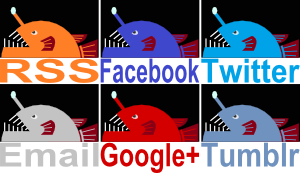 Then it could chomp down on the shriveled base of the tongue for more blood feeding goodness, and it might even occasionally NOT poop down the poor fish's throat. @shewalkssoftly.com: Hahaha! I know, it's quite shocking. @Crunchy: I think it probably takes it all from the bottom of the mouth and the lower lip or something. Perhaps mucus there is replaced by the fish very often, so it's a good food supply. It's pretty evident that blood in the tongue just gets drained away and isn't replaced quick enough. As for the poop: I don't think she cares! That first pic kinda amuses me. That little guy's just in there chillin out; he even looks like he's smiling. Yeh, this is one of those things that really doesn't bear thinking about! Traumatised me crashing to floor in dead faint, mouth gritted shut very firmly. Haha! Sorry! I usually find the scent of chocolate loosens my jaw pretty quick! , C. Exigua has 7 more hosts other than the Spotted Rose Snapper. By the way, do these lay eggs or what and if yes where? Inside the fish mouth? Wouldn't at all surprise me to learn they have more hosts! Yes they lay eggs. I think all crustaceans do. The Tongue-eating Louse is an isopods, and isopods are part of a group called Peracarida which are a whole bunch of crustaceans that have a brood pouch for carrying their eggs around. So eggs would be laid in the fish, but the female would carry them around on her. I'm French and I see these on more than half the fish I catch when I go fishing. I don't know if it's this very species or a relative though. Yeah, there are lots of relatives which do similar things or slightly different things. Lots of nasty lice to go round! I generally eat them with the fish. Tastes like shrimp. Hahah! There can't be too many parasites that people would happily fry up with its host. Not on purpose, anyway!